One unfortunate thing about the spiritual warfare of this end-time is that many warriors of the Cross use weapons that have not been proven. As a result, they either die on the battlefield or become prisoners of spiritual wars. Another lesson, particularly from the above scripture is that in spite of the disdainful weapon that David was carrying, Goliath still employed his spiritual allies; he cursed David by his gods. How I wish that all children of God will realise that it is not the grammar of the language they use that will do the work of conversion; it is by the Spirit of our God. Human methods have never worked in the history of the Church, men and women of God who succeeded in the ministry were those who allowed the Spirit rather than self might, power or administrative acumen to lead in their ministries. David was a better match for this warrior who was fighting through the spirit of divination and sorcery. He said: “…Thou comest to me with a sword, and with a spear, and with a shield: but I come to thee in the name of the Lord of hosts, the God of the armies of Israel, whom thou hast defied.” The end of the story was victory for Israel and great defeat for the Philistines. David used the weapon he had proven and found to be true; the name of the Lord. 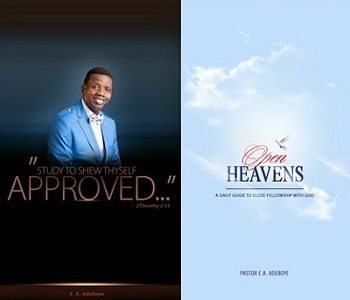 14 October 2016 Open Heavens. Use the Name of the Lord to confront the battles you are facing today and you will see them crumble before you. The Name is lethal.